Check out these great equestrian patterns! This horse blanket pattern can be used to make a wide variety of sheets and blankets for your horse. We give specific instructions for a sheet or single layer blanket, a two layer blanket, and an insulated blanket with belly warmer. The first two styles can have the options of a cutback or regular neckline, leg straps, fleece withers protectors, and tail cord. You can mix and match various options to create your own customized sheet or blanket. Also included are layouts and instructions for horse coolers in different sizes and fabrics (but no actual pattern pieces). The cooler has front ties, and brow and tail straps. Blanket sizes 58"-84". Keep your show baby sleek and clean with one of these stretch covers. The full head and body cover has a zipper underneath the neck, bellyband with hook-and-loop tape closure, and leg straps. The stretch sheet has a closed front, fleece neck opening, bellyband, and leg straps. This SuitAbility equestrian pattern includes five sizes of fly masks, with and without ears. The size range should fit from a foal up to a warmblood. The masks have fleece edging and are fastened with hook-and-loop tape. Bundle up your little one in a sheet or blanket. Instructions are given for single-layered, double-layered, and insulated blankets. This horse blanket pattern is semi-contoured with hip darts and has one or two front closures, a single surcingle, and leg straps. Also included is a pattern for an insulated, adjustable size foal blanket, with hoop-and-loop tape front closure. And your dog won't be left out with a two-layer blanket with bias surcingles and closed front. This SuitAbility equestrian pattern includes nine standard hood sizes to fit from a small miniature horse up to a warmblood. Hoods can be made from single or double layers of material or made using insulation (triple layer). The extra small sizes each have a wide surcingle at the throat and hook-and-loop tape closures. The four larger sizes each have one wide strap at the throat and five straps. These straps can be fastened with either surcingle buckles or snap hooks. Guidelines are also given for using hook-and-loop tape closures on the larger sizes. The hood attaches to a blanket or sheet with elastic straps. The pattern also includes five stretch hood sizes. The stretch hood is made from spandex (Lycra TM) blend fabrics. It has a fitted face, a zipper, and an elastic girth strap with hook-and-loop tape. This pattern contains standard saddle bags, a horn bag, a cantle bag, two styles of hay feeding bags, and full bale and half bale hay carry bags. The saddle and horn bag flaps are fastened with hook-and-loop tape. Instructions are also given for using buckle fasteners on the saddle bags or making them insulated. The cantle bag has D-rings for attachment to a western saddle. Both hay feeding bags hold several flakes of hay. The simple round bag has D-rings at the top and on the back for tying the bag in place. The square bag with webbing grid for a “slow feed” effect has a D-ring and two tie-down loops on the back and a detachable adjustable strap. A top flap fastens on the back of the bag with hook-and-loop tape. This SuitAbility equestrian pattern includes "square" quilted all-purpose and dressage pads; shaped fleece all-purpose, dressage, close contact, and forward seat pads, a trail pad, and all-purpose and dressage half pads in two sizes. All square and shaped pads have billet and girth straps; the half pads have billet straps. The trail pad has a fleece bottom, billet straps, two expandable pockets, and optional removable foam inserts. Also included is a quarter sheet with billet, girth, and tail straps. WOMEN”S drawcord elastic waist tights have a regular lower leg and knee patches. WOMEN’S bootcut tights have a wide waistband with elastic and leg patches. Both GIRLS’ versions have a drawcord elastic waist with regular or jod-style lower legs and knee/leg patches. Optional full seat overlay, crotch pad, and belt loop pieces are included. Tights do not have inner leg seams for riding comfort. Our men's basic stretch breech pattern includes an optional front zippered pocket and a buttoned back pocket. Similar in design to the women's model. FOR STRETCH FABRICS ONLY! Be protected from the elements in or out of the saddle! This pattern actually has four coat versions: a simple ¾ length rain slicker, the traditional caped Aussie coat, the even more traditional English Macintosh, and the dashing western duster. The Aussie coat can be lined or unlined with adjustable sleeves and snap front. The fully lined English mac has zippered front and elastic storm cuffs. The slicker is unlined. All three have snapped back vents with saddle gussets, raglan sleeves, and snapped storm fronts. The western duster, traditionally made of cotton canvas, has corduroy accents, handwarmer pockets, and buckled side tabs. It snaps around legs for riding or up to a shorter length. Use this pattern to make chaps for the whole family. Western show chap options include fringe or scalloped sides, one or two concho back, and three different yoke/cuff lengths. English schooling chap is basic shotgun design with buckled back and two yoke options. Can be made from leather or Ultrasuede. Both children and adult sizes in ONE PATTERN. Fits upper thigh measurements of 13" to 27". This pattern includes three different helmet covers. The TRADITIONAL cover fits the older style caliente helmets. It has stitched and taped seams for durability, an elasticized back, and covered button or pompom on top. It also has a brim with enclosed stiffener. The STRETCH cover fits the newer, larger safety helmets. It requires stretch fabric and has an elasticized bottom. It is designed to fit a helmet that already has a brim. Both covers have ribbons ties in front. The WINTER cover is made of Polartec TM fleece fabric and has a neck wrap for extra warmth. This pattern also includes half chaps with inner leg reinforcements, Velcro tab closures, and elastic foot straps. It has seven different sizes. 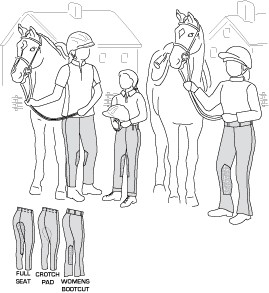 The complete tack protection pattern! Quilted and lined saddle carry bags unzip all around - English bag has detachable shoulder strap, Western has loop handles. Center zip English bag has extra room for other items and can be lined with fleece or made unlined with pommel and cantle padding. Both English saddle carry bags fit most styles of English saddles, including dressage saddles. The bridle bag comes in two sizes, 27" long and 32" long. Saddle covers protect your saddles in the tack room; Western version can be made as a rain cover for riding with D-rings so that you can tie the cover to your saddle..
Use this pattern to make any combination of tote or garment bag with optional boot or hat compartments and whip holder. Tote bag has zippered end pocket and two inside pockets. Garment bag has side zipper and zippered outside pocket. Can also make separate boot and hat bags. For hunt, field, paddock, Jodhpur, or cowboy boots! Everything you need for that trip to the big show! Includes instructions (but not actual patterns) to make one set of stall curtains consisting of one back curtain, two side curtains, one front curtain, one set of front door curtains with tiebacks, a front double valence, and name panel. Patterns are included for three different valence styles, one complete alphabet of lettering, and four different horse appliqués. Also includes source information for curtain fabrics. To get your horse safely on the road, are patterns for two styles of fleece-lined shipping boots, leg wraps, and a leather head bumper. One style comes over the horse's knees and hocks, the other ends below. Also includes instructions for leg bandages. Once at the show, you'll be super organized with a grooming apron and tote. The apron has five pockets; the tote has four outer pockets and four inner compartments. This fabric is similar to the Spandura line; it is a hi-tech high performance cotton/lycra knit that works where abrasion resistance and endurance are a critical factor. Due to it’s mostly cotton content, this fabric is extremely breathable. This fabric is perfect for your equestrian needs. This newly developed lycra combines the durability of Cordura nylon and the stretch of lycra. The result is a hi-tech high performance nylon/lycra knit that works where abrasion resistance and endurance are critical. Makes great riding breaches! This 100% solution dyed polyester incorporates UV resistant characteristics for long-term color and strength retention along with excellent breathablity and abrasion resistance. The HydroMAX finish raises the bar of hydrostatic performance and delivers unsurpassed water repellency, mildew and oil resistance without relying on environmentally unfriendly coating compounds. WeatherMAX 65 has anti-microbial properties and a minimum UV resistance of 1000 hours but only weighs 6.5 oz./sq. yard due to the use of a filament rather than a spun yarn like acrylic fabrics. Excellent for anything from horse blankets to tough outerwear to marine grade tarps. A polyester insulation that has been quilted to a lightweight taffeta face. This is a great way to line and insulate your garment at the same time. Gives surprising warmth without adding bulk. Perfect for sleeping bags, jackets and horse blankets.